Da Capo Lifelong Books, 9780738218861, 288pp. Cooking doesn't have to be a chore. Why make it difficultwhen it can be easy? 1. Go between scratch and homemade with her handy shopping guide. 2. Mix and match recipes that build on the same ingredients. 3. Break any rule that makes you want to bolt from your kitchen. With recipes for: Blueberry Almond Polenta, Country-Style Greek Salad, Slow Cooker Hoisin Pulled Pork, No-Fuss Roasted Paprika Chicken, Chili-Rubbed Steak Tacos, Salmon Rice Bowl, Parmesan Roasted Broccoli, Easy Food Processor Pizza Dough, Gingered Peach Crisp, Hummingbird Muffins, Bacon Cheddar Waffles...and many more! 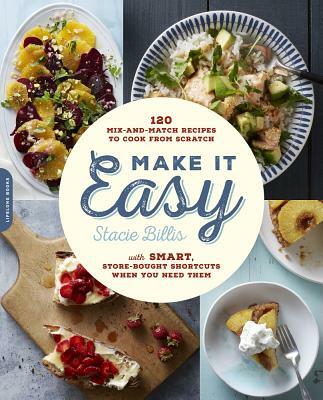 Stacie Billis is the food writer behind the award-winning blog One Hungry Mama, where she serves up original family-friendly recipes and tips for managing life as the family cook. Stacie is also Managing Editor of Cool Mom Eats from the publishers of Cool Mom Picks, the only dedicated food site that shares recipes, tips, and food finds curated specifically for the family cook. Stacie's common sense approach stems from her Masters in child development, as well as her experience developing an organic family food brand, but her popularity might have more to do with her cheesy sense of humor and non-judgy approach. Her love of donuts helps, too.